If you haven’t seen Gary Vaynerchuk on his internet wine tv show you are missing out on an experience. He’s funny, entertaining, and most importantly he knows his wine. 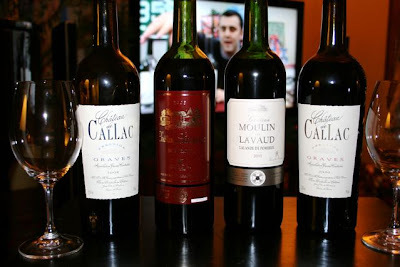 He has been talking about the ’05 Bordeaux vintage for a while now and he offered a secret xmas pack of four wines to taste along at home on Christmas eve. I jumped at the pack as I need to learn more about French wines. It was great to taste these and compare my experience with Gary as he tasted them on the show. Here’s my stream of consciousness as I was tasting them. Hints of lemons and bananas on the nose mixed with some grass. A bit of nail polish remover that dissipated after a while. Creamy smooth on the palate. A refined wine. Long finish. Delicious flavors of buttery lemon and pineapple. The nicely balanced acidity is not too sharp but definitely can stand up to food. This is fantastic and is one of the most interesting white wines I’ve had in a very long time. Young, fresh fruity raspberry and cherry nose. Bright purple color. Fresh fruit right up front of cranberries and raspberries. Medium bodied. Nice tannins that ends with wood on the back palate. Fruit up front then wood on the end. Not bad for $9. Hint of earthiness on the roof of my mouth in the mid palate. I wish the fruit lingered a bit longer before the wood took over, but it is a very nice complex wine for the price. Bright red color, not too deep. Cherries meet strawberries on the nose. Soft tannins, elegant, medium bodied, vegetable and sour cherries. Some wood and flowers on the end. Finishes with a spicy wood flavor. Dark purple red color. BIG nose of red plums, strawberry, red raspberries and licorice. Cherries, roses, red fruits, strawberries, strong tannins, soft acid. Medium bodied. Ends with tannic wood.